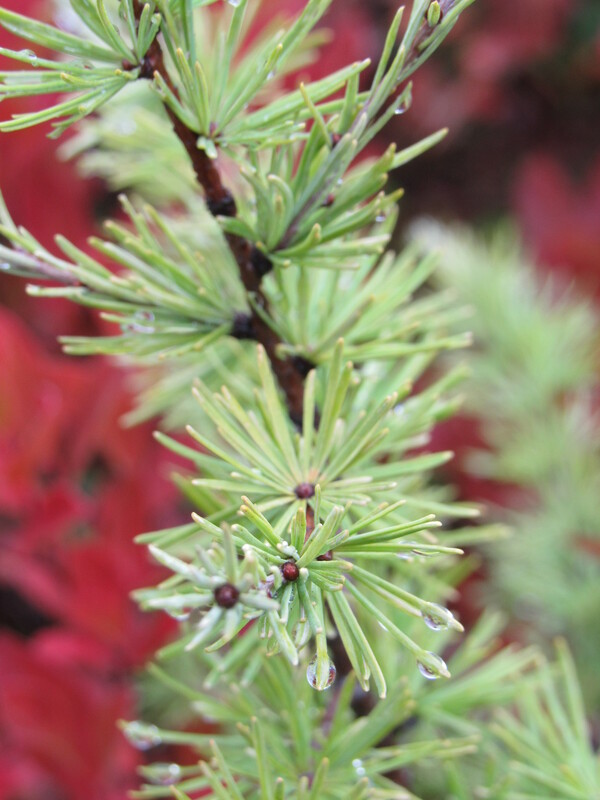 Today it rained strong and steady throughout the day. I am quite certain that every living thing had their mouths tipped skyward to catch every precious drop. Rain, glorious rain. Like most people in Maine this year, (80% of the population), we experienced severe to extreme drought. Our well was not up to supplying enough water for the household and the containers in the nursery. It certainly was not up to watering the display beds. Luckily the sheep were at another location where the well was ample for their needs. Since the display beds were on their own, It was interesting and informative to see that some plants actually did quite well while others definitely did not. Those that were stressed, like the deciduous ferns and astilbes, simply went into an early dormant state and started to drop their fronds or shrivel up in an effort to conserve moisture to the crowns and roots for survival. We cut them back, as it was happening, to help them out. Since no appreciable rain came or was in sight in September, we started to cut back more and more of the perennials. 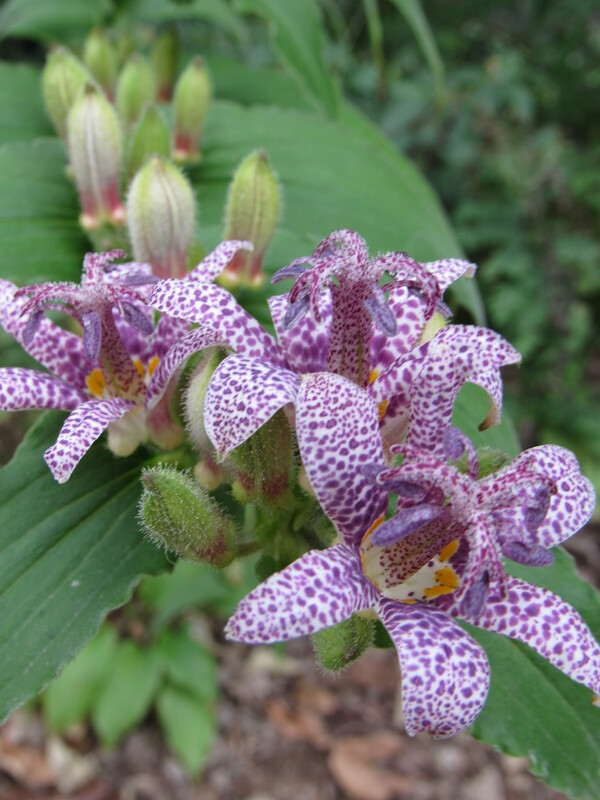 Plants with large leaf surfaces like hostas, Ligularias, and Rodgersias lose water faster than others, and the larger leaves heat up more as well, calling for more moisture to stay turgid. Since we do not have regular hours for the nursery in October, we decided to cut back all but the evergreen perennials. The evergreen ones, hellebores, male ferns, gingers, and some epimediums seem to be faring much better. Probably by going dormant early, and employing the same mechanism that allows them to keep their foliage through the winter and not dedicate. I have full confidence that the plants we cut back will have set enough new eyes, buds, and roots for next season. With the rain we are having now, and watching the leaves from the trees fall, I’m going to offer this piece of advice based on an observation; with fall clean up, many gardeners rake or blow out all of the leaves from the gardens. We never take the leaves out of our display beds, allowing them to stay as mulch and as a natural fertilizer. Considering how bad the drought has been, how dry the roots of your plants could be, and no guarantee of how much more rain and snow we will get, I would not remove the leaves, and let them hold in as much moisture as possible through the fall and winter. If your garden does not have leaves falling into it, I’d mulch it with shredded leaves or another good mulch. Your plants will thank you for it. Remember that this is a time of year when the roots of plants are still very active and will benefit immensely from this rain. I believe it is very important to retain as much moisture as possible in the soil now before it freezes and can no longer accept water. I’ve knit several brown sweaters over the years. Yes, one was for my love and he continues to wear it when winter’s at its coldest, an insulated woolen armor just right for those very bitter -20 below days of January. Another was knit for a little boy, who will very soon be turning the ripe old age of 21. He quite often pesters me (his devoted mum) for another one. I’ll try and get to that this winter. 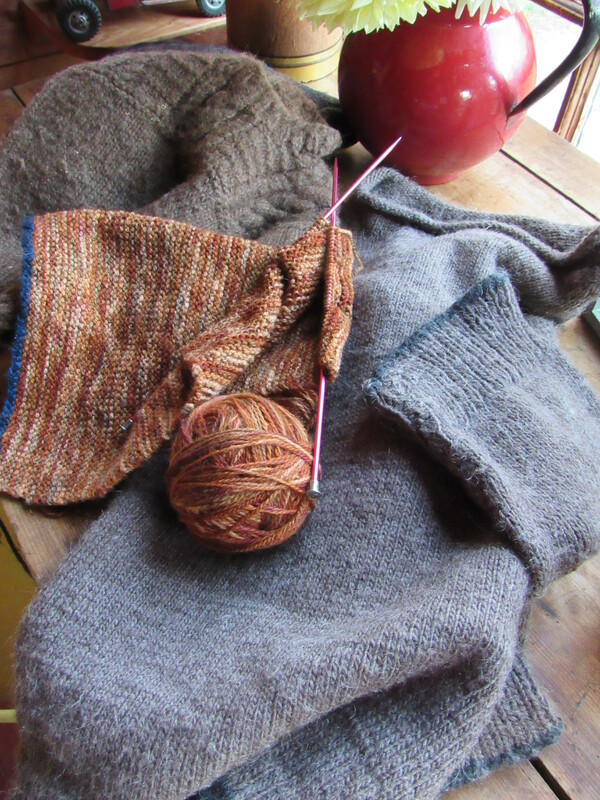 Right now, I have a multi-colored brownish sweater in the makings…for me, can that be? Really? Something for me?!!! But the brown sweater that still stands out in my mind was the one being made by my young friend Sandy many years ago. She had just finished her degree in marine biology at the University Of Maine. After graduating she worked with me in the bakery and was not quite sure where her feet were going to land that summer, so she came to live with us. When she wasn’t rolling out pie dough or playing her guitar, she was working on a brown sweater intended for a boy she couldn’t get her mind off of. I’m not sure that the feelings of devotion and passion were reciprocated, but I do remember with fondness the brown sweater, Sandy’s tender heart, and her intention to win him over with skeins of soft brown wool. After a long day of turning butter and sugar into scrumptious pastries, Sandy would come home, turn on some music, open a beer, and pick up her needles. Between sporadic dates with that boy, she kept her needles clicking with hope. That boy didn’t take the bait…his loss. Sandy went on to further her education, land an important job in the field of environmental policy, and make her way in the world. She always was and she is, quite a gal. Sweater or no sweater, she’s a catch. I hope Sandy is still playing her guitar. I like to picture her playing one of her great tunes wearing a too big handknit sweater. Maybe singing a sassy song about lost love, freshly baked scones, and a summer spent with a mom and her two kids. So, in memory of brown sweaters knit with love, a poem by Kate Barnes… for Sandy. way he turns, some will lie by his heart. and lead them to you like horses brought up from pasture. as resilient as moss. I look at you busily wishing. or a falling star, each good in your mind for one wish. about him. Every night you dream about him! Every day – all day -you are listening for his truck. who makes the best of what Fates send him? of stray dogs yelping behind her in our hayfield. Give me magic, give me hope! love and luck to the wearer – without his knowledge. Bogs are one of our favorite habitats. We are lucky to have several nearby, and we love to walk down to explore them. The closest is only 1/4 of a mile down from the edge of our woods. 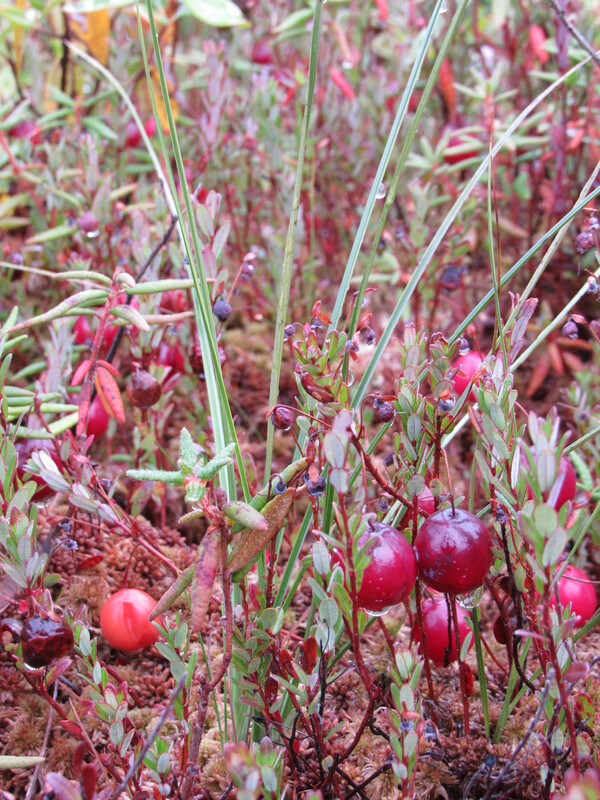 This time of year I go to harvest some of the wild cranberries (Vaccinium oxycoccos) that are growing there. I’ll use the cranberries in a sauce to can for the holidays and freeze some as well. 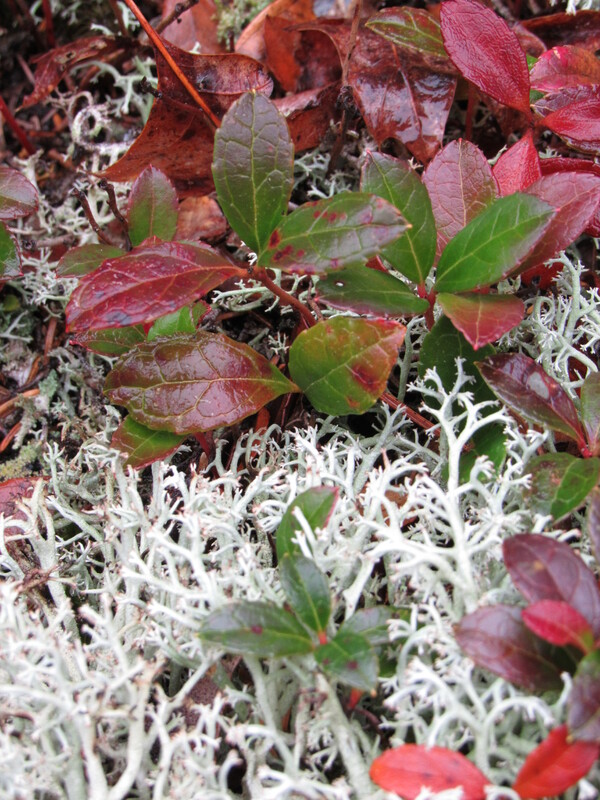 I love squatting down among the now crimson red sphagnum moss (Sphagnum rubellum), the rhodora (Rhododendron canadense), and larches ( Larix laricina), to fill a small basket with the tart berries. I also love feeling the satisfaction of having this fruit, which is so rich in both antioxidants and nutrients, so close by. It’s quite serene in the bog, a divine stillness really. I am certain it is a place we won’t likely bump into fellow (human) ‘woods walkers’, though it is evident that deer and moose are finding refuge in the bog. We follow their trails along the edge, and we can see where they have stopped to browse many of the water plants that grow there. This particular bog does not have much open water. 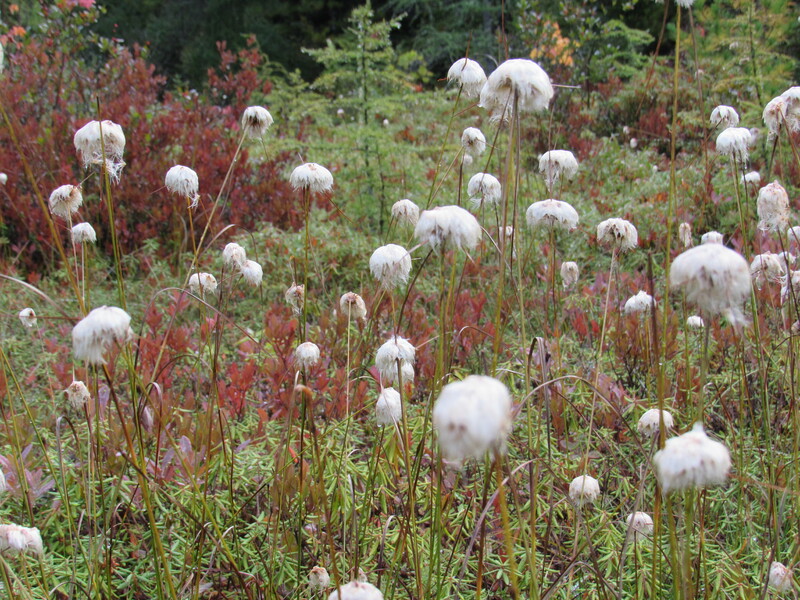 It is covered with a thick mat of sphagnum moss, cranberries, three- seeded bog sedge (Carex trisperma), tawny cotton grass ( Eriophorum virginicum), rhodora ( Rhodora canadense), and Labrador Tea (Ledum groenlandicum) to name a few. The color in the bog is stunning right now, although we love the beauty and diversity of these soggy habitats all year round. Now that the gardening season is winding down, it allows us to do a little exploring. 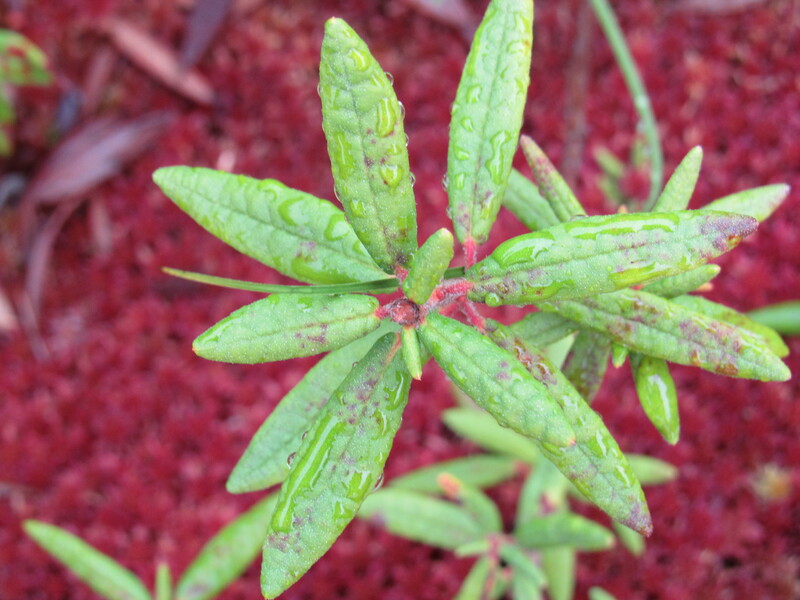 If you know of a bog near you….treat yourself, and go check it out! It won’t be long before we bring the sheep home. Their summer pasture is dwindling and soon they will be on their winter diet of hay and grain. We try and stretch their time on grass as far into the season as possible, but this year with rainfall way below normal, the fields are not recovering as quickly. We do practice a rotational grazing system, moving electrified portable fencing every week. This system is a great way to manage a pasture. It helps to maximize forage growth and encourage desirable plants to regenerate. Given a large free range of area, sheep will graze on the most choice forage, basically eating what tastes best and is most nutritious, leaving the undesirable plant material. Fields can quickly revert to weedy pasture if not managed. These weed plants are great opportunists and have the vigor and tenacity to out-perform the grasses. Without management, this less desirable (and less nutritious) plant material will crowd out the better grasses we want for our sheep. 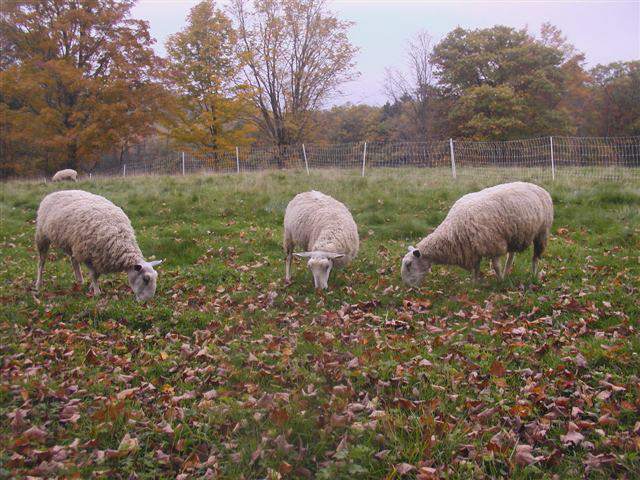 In order to maximize forage growth and to encourage the fodder we want, the sheep are moved through a series of fresh pastures in order to provide a “rest period” for plants to regrow their leaves (grass). The sheep are also forced to graze down the weed material, keeping it from going to seed or taking over. We watch each paddock carefully, keeping an eye on its regeneration and then knowing when it is time to circle back and graze that area again. Moving fence is always on our weekly or bi-weekly chore list. This year, because of the lack of rain we watch each field carefully to make sure they are not overgrazed or stressed. Rainfall, our flock size, and soil nutrients can all play a role in pasture health. It seems our life always has an aspect of ‘plant tending’, whether it is on a large scale ( the sheep fields) or on a smaller scale ( the nursery and gardens), we are always mindful of the botanical world that surrounds us. After a little rain, finally, (though not nearly enough) we found several mushrooms while outdoors yesterday.I think these are Coprinus (please, correct me if I’m wrong) and were among the many varieties we found. 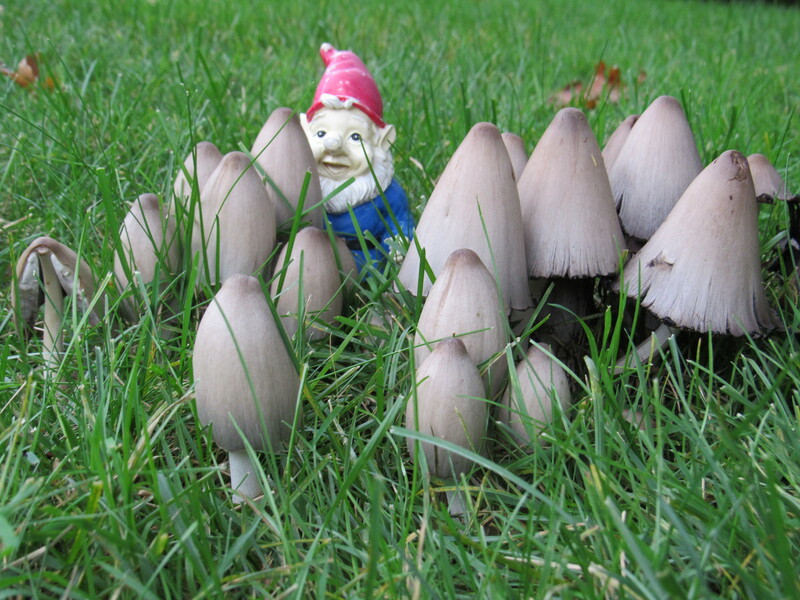 I couldn’t resist the portrait of ‘gnome with mushrooms’…. just the kind of weird thing you do on your first day of being closed after a long season! Actually, though we are technically closed for the season, if you really need some plants, we are open by appointment through the month of October. Now that we are getting a bit of rain, you may have a few last selections before the snow flies. Feel free to call us if you’d like to visit the nursery between now and the end of October, we’ll be sure to make some time for you. 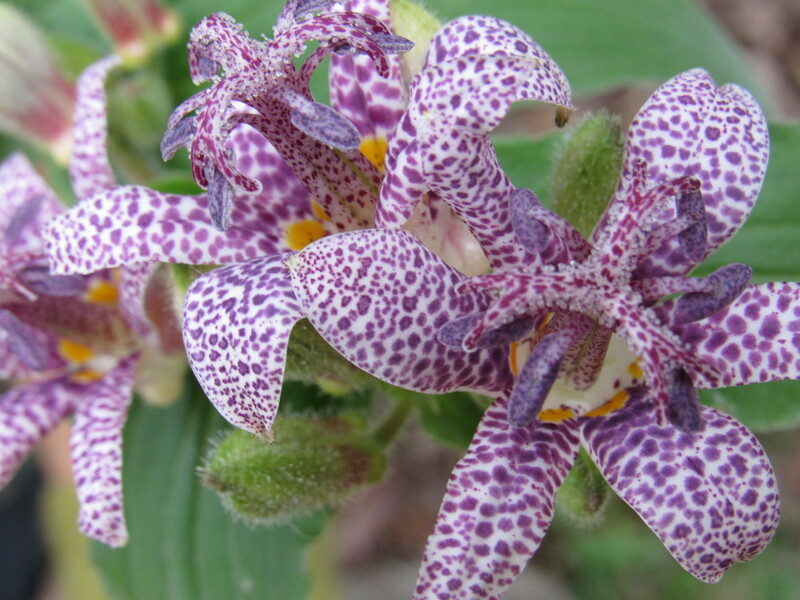 Tricyrtis miyazaki is on display in the shade gardens at the moment. Yesterday, I even pulled my intern off the shingling job she was working on to sit and take a closer look at these fascinating blooms. There should be a fancy hat designed after this late season jewel! It has faired well in the border of one of the display gardens here, despite the drought conditions, and is a great companion to the hosta and ferns growing along with it. Even though we are winding down in the nursery, there are still so many things to enjoy in the gardens.